For over 118 years, the Van Matre family has stood with grieving families and has watched communities mourn the loss of their own. Currently, there are three licensed funeral directors in the family with over 111 combined years of experience. Three locations in the geographical area between Erie and Meadville make the Van Matre Funeral Home the convenient choice for your family. Comfortable and relaxing, spacious and attractive. These are the words that describe the facilities you will find at the Van Matre Funeral Home. The Van Matre family personally involves themselves with every detail of each funeral service. They believe that when you are faced with making important decisions about a loved one, you deserve care, compassion, and concern. Burial or cremation, funeral pre-planning, and traditional and non-traditional funeral and memorial services are offered with personalization options like printed products, DVD’s, and video and audio enhancements. 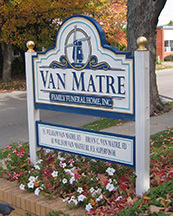 The Van Matre Funeral Home offers competitive pricing, assistance in paying cash advancements to cemeteries, florists, or newspapers, and a payment plan which includes no interest for 30 days or longer if an acceptable estate or insurance settlement is agreed upon. The full extent of our efforts is determined by your selections made according to your needs and your wishes. If you are dissatisfied with any of our efforts, we will reduce or eliminate the associated charge.